It’s Ash Wednesday. It’s the beginning of the Lent season. All over the world people are “giving something up for Lent”. Chocolate has consistently been the #1 thing most people give up for Lent. Baffling. But for the past several years, “social media” has been among the top things people do without (or attempt to) for those 40 days. You might be one of them. If you are, you can decide for yourself if my blog qualifies as social media or not. Personally, I vote “no”. Solitude is the intentional creating of distance between us and significant distractions that typically come through noise, through interpersonal conflict, through busyness, through the competitiveness of daily life, and through the pace of our culture. It is purposefully saying “no” to the many things that call to us “here!” “No, over here!” “Look this way!” “Over here!” “Please! Just for a minute, look here!” Its exhausting and we know it. We try hard to manufacture the gumption to address it for a time, but sooner than later it crowds in and we succumb to it again and again. So, if I’ve remotely described you then let me prescribe some ideas you might consider. 1. Give the first half hour (or full hour if you can) of your day a No-Buzz Zone. That means no cell phone, no news, no Twitter, no Facebook, no television, no texting, no nothing that involves a screen or any type of connection via technology. You’re purposefully unavailable. Let’s call it technological solitude. 2. Do not take anything from your job home with you. I know this doesn’t apply to everyone, but many people bring a briefcase, backpack, or laptop home with them. When you’re home, be home. Let’s call it vocational solitude. 3. Find or create a place of quiet in your home. If you’re a Duggar and that’s just not possible, then create it outside your home. For the month of February, Chick-fil-a is giving away a free coffee (hot or iced) when you visit. No purchase necessary. And even if you don’t have a sweet deal like that where you live, find a way to get somewhere that is yours. A place you can read, think, dream, draw, write, or sip. 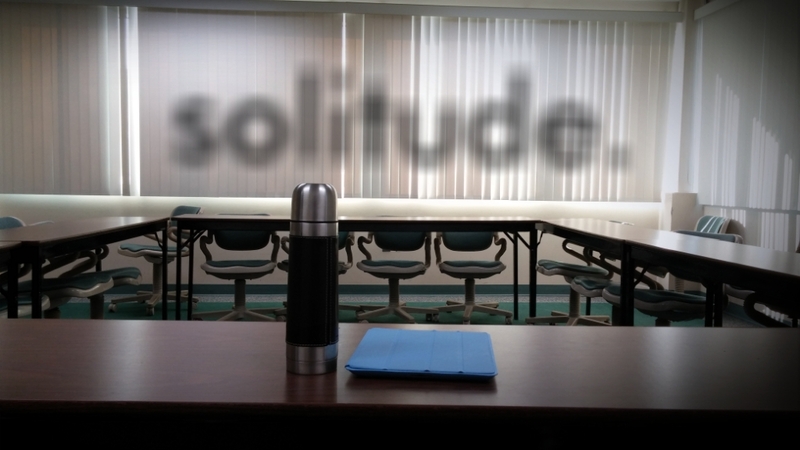 Let’s call it…um….solitude. Certainly there are more, but choose one of these for the next 40 days and see what happens. If you’ve got another suggestion you’ve done or would like to try, post it in the comments section. I’d love to hear it! Consider the fact that Jesus often got away from the crowds and even his closest friends for the sole purpose of being alone in prayer. (Mark 1:35, Matthew 6:9-13, Matthew 14:23, Luke 6:12, & Luke 22:41-44) Not only that, but his ultimately triumphant earthly ministry started with an extended period of solitude. Times to refresh and recharge are modeled to us by the Son of God and reflect the good gift of solitude that God the Father wants to give us for our health. Believe me, I love being around people; laughing, talking, sharing, debating, storytelling, and listening but we’ve got to realize our inherent need for occasional, but regular times of solitude. What about you? Do you need to recalibrate through solitude? What stands in your way most often? Is solitude a ridiculous idea in our hyper-connected culture? Do you see our connectedness as potentially harmful? ← You’re Not Going To Reach Those 2015 Goals And Here’s Why. I did this once! So hard 😦 Good luck! I have up social media as part of my bigger sacrifice of cutting out soccer front life! Most of my followers are either the teams and athletes themselves or sports related news accounts and my unhealthy obsession was transformed during those 46 days. It still remains the most difficult thing I’ve ever done and I wouldn’t have realized how insanely I was obsessed with the sport. It was essentially an idol for me. I was also concerned about how I would let the game back into my life after Easter but the more I seemed the Lord during Lent, the clearer he revealed it to me. And while I’m still a really big fan, it doesn’t consume my life as it once did a few years ago!